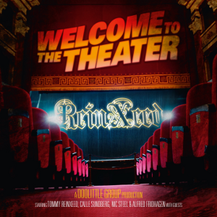 The Power Metal Explosion Continues: Tommy ReinXeed vocalist, guitarist and producer of ReinXeed, is back with the 5th studio album by ReinXeed called Welcome To The Theater. All previous albums by ReinXeed have reached good sales in Japan and reaching new fans all around the world everyday. The bands latest videos have over 200,000 views on Youtube. The power metal explosion from Sweden continues and fans of Helloween, Rhapsody Of Fire, Avantasia, Sabaton and Edguy will love the new effort from ReinXeed. The band will start The Power Metal Explosion Tour in early June. This album to be released from King Records on May 23rd in Japan and Liljegren Records/Doolittle Group on May 30th in other countries.